Manufacturers in the SPECT arena continue developing technology that reduces scan times and radiation doses. With an aging population, the need for this modality—particularly in cardiac care—will continue to grow. However, some in the industry worry that reimbursement levels and the overall economy may slow the adoption of SPECT systems among hospitals and imaging facilities. Creating flexible alternatives is one way Digirad CEO Todd Clyde sees his company making a difference in the industry. The company’s ergo large field-of-view, general-purpose portable imaging system, which received FDA clearance in 2010, enables imaging to take place within the nuclear department as well as other units throughout the medical facility. The ergo is based on 12.25- by 15.5-inch field-of-view solid-state detector technology. The system’s spatial resolution of 3.25 mm is suitable for handling various general planar imaging applications. Clyde believes this mobile option gives medical facilities a cost-effective alternative to standard “fixed” devices. Hospitals have a need for solid-state, general-purpose cameras that can do much more than traditional devices, he says. The ergo provides institutions with the means to reduce costs for several procedures and improve productivity and flexibility. In addition, patient comfort can increase as the waiting time decreases. In one instance, the ergo becomes a tool in the operating room, where surgeons can use the device to check a patient’s blood flow after an organ transplant. Another time, the device can be used as a tool in the emergency department to conduct a brain scan on a patient brought in following an automobile accident. Women’s health practitioners may benefit as well, with ergo used in the battle against breast cancer as a scanning method for women with dense breast tissue. “The ergo gives medical professionals the ability to make immediate decisions that are important to the health of their patients. It can dramatically improve diagnosis and, overall, gives physicians access to nuclear imaging at the right time,” Clyde says. Dilon’s GammaLōc localization system enables breast-specific gamma imaging (BSGI)-guided stereotactic needle biopsy procedures to be performed on the Dilon 6800 gamma camera. As an adjunct to mammography, BSGI utilizes the Dilon camera to help physicians differentiate benign from malignant lesions. With 180-degree open access for gamma-guided biopsies, the GammaLoc system enables physicians to calculate lesion location and depth. The system’s interface guides users through the procedure with detailed instructions. Dilon’s GammaLoc technology utilizes a technique similar to that used in stereotactic x-ray localization. Its CorreLocator paddle and StereoView imaging collimator system takes stereo views from both the right and the left side at 20-degree angles. The location and the depth of the lesion are clearly identified at the point where the angles intersect. The CorreLocator paddle provides optimal breast stabilization with consistent results. The Dilon gamma camera is unique in that its high-resolution, small field-of-view device can detect early-stage cancers, locate lesions independent of tissue density, and provide multiple-angle views for direct correlation with mammography. In addition, the camera’s compact mobile design does not require a dedicated exam room. Installing Discovery NM/CT 670 in the U.S.
SPECT/CT technology introduced 10 years ago by GE Healthcare continues to expand in scope and functionality. GE is now installing its Discovery NM/CT 670 hybrid imaging platform in the United States after rollouts in Europe, Asia, and the Middle East. The Discovery NM/CT 670 system combines the state-of-the-art CT Nuclear Medicine detectors with a newly designed SPECT gantry and the BrightSpeed Elite 16 slice CT system. With this development, the system has the capability to shorten acquisition times, improve dose management, and enable more convenient patient scheduling. With conventional nuclear hybrid imaging, a complete hybrid bone scan can take up to 55 minutes. The Discovery NM/CT 670 reduces the imaging time to as little as 16 minutes. 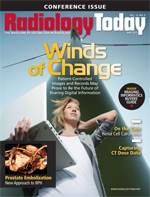 Shorter scan times mean patients are more comfortable and image quality is improved. Reduced scan times also mean lower doses, another goal GE Healthcare works to achieve with its Alcyone technology. The system enables views of cardiac anatomy and functionality with excellent clarity and speed, resulting in scan times as short as three minutes or up to a fourfold reduction in dose. In the molecular breast imaging arena, GE Healthcare announced in late 2010 FDA clearance of its Discovery NM750b Molecular Breast Imaging system with cadmium-zinc-telluride (CZT) detector. This device utilizes a gamma camera dedicated to breast imaging based on the accumulation of a radioactive tracer in hypermetabolic cancer cells. The innovation is in the use of CZT to replace the standard sodium-iodide detectors routinely used for gamma cameras in a dedicated breast and small organ device. This technology is intended to improve early detection of breast cancer, particularly in women with dense breast tissue. Regarding the use of CZT, GE Healthcare recently announced the company’s acquisition of Orbotech Medical Solutions, a manufacturer of CZT detectors used in its Alcyone nuclear medicine technology. Philips continues to improve diagnostic accuracy with its Astonish reconstruction algorithm that features a dual-filtering technique designed to minimize noise and help improve uniformity of imaging. According to the company, a multi-center study of the clinical performance of myocardial perfusion SPECT imaging using Astonish showed that this reconstruction tool addresses common concerns such as cost, acquisition efficiency, radiation dosage reduction and improves accuracy. The company said that in another study Astonish was shown to potentially reduce time and dosages by eliminating the need for patients to undergo both stress and resting imaging. With low-risk patients, the accuracy Astonish brings to the exam reduces the need to compare stress and resting studies. Philips’ BrightView XCT, a SPECT/CT system designed entirely for nuclear medicine, has ties to Astonish. BrightView XCT allows for low patient dose levels, high-resolution localization, and high-quality attenuation correction—all with the potential for fewer artifacts and shorter exam times, according to the company. With the BrightView XCT, coplanar imaging allows users to acquire the SPECT study and CT map without any table motion between the two devices. Emission data can be corrected from the transmissions. Siemens completed a full release of its IQ·SPECT product feature last fall and, in short order, received the 2011 Product Differentiation Excellence Award for Nuclear Cardiology in North America from research firm Frost & Sullivan. According to Chad DeGraaff, RT(R)(CT), Siemens’ national manager for SPECT and SPECT/CT, this award recognizes how IQ·SPECT fits the needs of the current marketplace, where economic concerns and issues surrounding reimbursement and appropriate care are taking center stage. IQ·SPECT, used on the Symbia S and Symbia T series imaging systems, addresses both speed and dose reduction. With a field-upgradeable combination of hardware and software, IQ·SPECT helps nuclear cardiologists cut the cardiac imaging protocol from 20 minutes to less than five minutes. Shortened exam times enable a sustainable approach to nuclear cardiology that can result in reduced patient radiation dose. The system has shown reduced radiotracer doses of up to 50%. IQ·SPECT utilizes SMARTZOOM collimators that focus on the heart. According to Siemens, these collimators collect up to four times more counts than a conventional large-bore, parallel-hole collimator’s magnification zone. In addition, a proprietary 3D reconstruction algorithm models the position of each of the 48,000 collimator holes on each detector, allowing state-of-the-art distant-dependent isotropic resolution recovery, CT-based attenuation correction (when using SPECT/CT), and energy window-based scatter correction. In addition to IQ·SPECT, Siemens Symbia.net thin client solution workflow server is designed to provide staff with access to both postprocessing and reconstructing raw data from a PC or a Mac. This application has a user-friendly interface and advanced automation features designed to improve clinical workflow by providing staff with easy access to all patient cases. Spectrum Dynamics recently announced its collaborative efforts with CZT supplier Redlen Technologies Inc and shipped its second D-SPECT system using nuclear imaging detector modules from this new supplier. Spectrum plans to continue the worldwide ramp-up of its cardiac SPECT imaging system, which was commercially introduced to the market in 2008. Josh Gurewitz, vice president of sales and marketing for Spectrum Dynamics, describes the cardiac-specific D-SPECT device as unique in the marketplace, as it incorporates nine rotating columns of CZT detectors that focus on specific anatomical points, a feature designed to improve signal to noise ratio. The arrangement also eliminates the need to rotate the gantry or the patient during the exam. D-SPECT functions with larger radiation collection angles and a scan pattern that provides 10 times more efficient photon collection, according to Gurewitz. This results in improved count statistics and ultimately higher-quality images. In addition, solid-state CZT-based detectors, combined with new reconstruction algorithms, provide the foundation for rapid imaging. These advancements may also enable new clinical applications in the future.